These Sweet Potato biscuits are insanely good. Is the picture making your mouth water? Seriously, they are amazeballs! 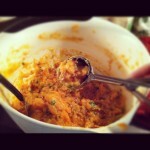 A perfect side dish to your Thanksgiving feast! This is a simple recipe that doesn't take long to throw together, but even better, these are fine to put in the freezer or fridge if you want to make ahead of time to make your Thanksgiving prep a bit easier. Just put them in the oven on low heat for a few minutes before you serve them. I'm pretty sure I will make these throughout the rest of fall and winter months for a great side. They are delicious and are nutritious. Grain Free & Gluten Free! 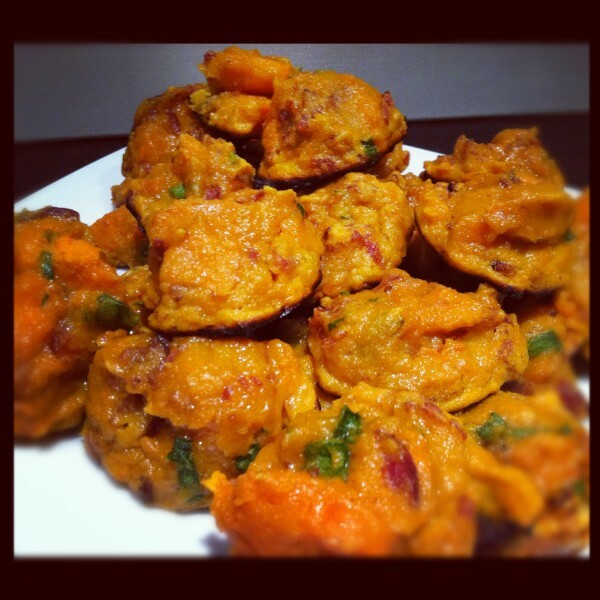 Pork holes in your sweet potato with a fork. Place in oven and bake for 30-40 or until soft. 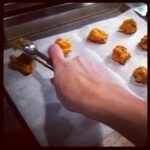 Once the sweet potato is done baking, turn oven down to 375 degrees. 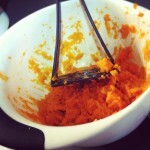 When the sweet potato is done, peel and place in a bowl and mash with a fork or a masher. 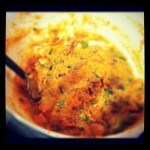 Add in eggs and mix well with your sweet potato. Then add your in your melted coconut oil. Add dry ingredients: coconut flour, baking powder, garlic powder, and salt and pepper. Add your diced cooked bacon and chives. Mix thoroughly. Line a baking sheet with parchment paper and use a large spoon (I used my cookie scoop) to drop your biscuits on the sheet, shaping them as needed. Let cool, and then serve or freeze/refrigerate until your Thanksgiving feast.